The Macallan, distributed by Maxxium UK, has unveiled The 1824 Series, a range which features two of the whisky’s “key strengths” oak sherry casks and natural colour. Bob Dalgarno, The Macallan Whisky Maker, has created four expressions by identifying the natural colour formed during maturation in different casks types to create the character informed by these colours. The expressions are Gold, Amber, Sienna and Ruby, all names reflecting the actual colour of the whiskies in the range, but also describing naturally occurring mineral and metals. Dalgarno said: “The Macallan world of colour is the true inspiration of the 1824 Series. Using colour to drive and define a whisky differs dramatically from the conventional age approach, allowing us to explore different casks and take a more flexible approach to our stock. The casks chosen for the range deliver a gradation of colour from light to dark, with the wood character defining each expression’s flavour, moving from lighter, lemon citrus to richer, dried fruit notes. As the whiskies become darker and richer, so the pool of casks able to deliver this character becomes smaller and rarer. Commenting on this latest range, Ken Grier, director of malts with Edrington, said: “As some 60% of the aroma and flavour of The Macallan derives from the oak maturation casks, this new range is a genuine opportunity to demonstrate the critical role of these exceptional casks and also to challenge perceptions about bottling at arbitrary ages. 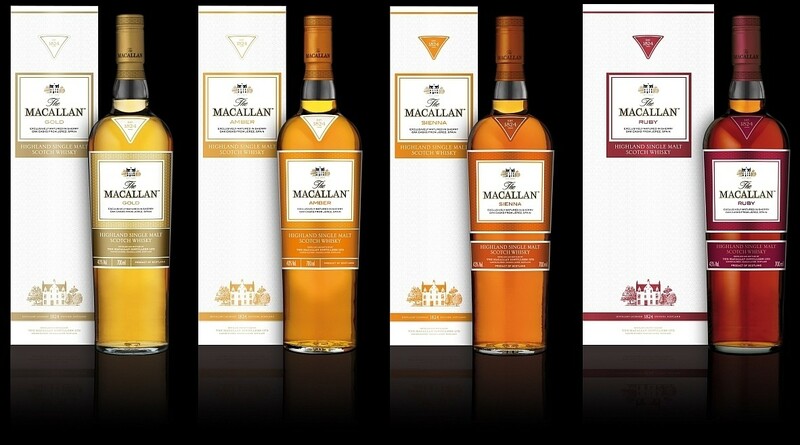 The Macallan Gold (RRP £36), The Macallan Amber (RRP £45), The Macallan Sienna (RRP £66) and The Macallan Ruby (RRP £120) will be available at selected whisky retailers.